‘The Birmingham band’s story is already the stuff of legend: a rip-roaring rock’n’folk odyssey set to a backdrop of over 20 years of UK pop culture at its very best. 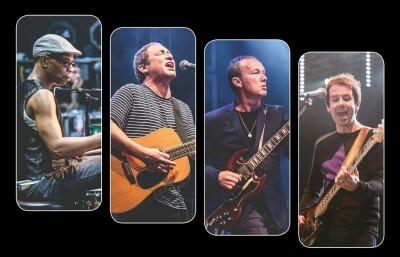 Ocean Colour Scene have notched up nine albums, three of which went Top 5 – 1996’s Moseley Shoals, 1997’s Marchin’ Already and 1999’s One From The Modern – and a run of nine successive Top 20 hit singles commencing with 1996’s The Riverboat Song. They supported Oasis at their massive Knebworth shows that same year, and two years later helmed the biggest arena tour of any UK band to date. Their achievements have been nothing short of phenomenal. From their days as Breton-shirt wearing disciples of The Stone Roses (debut single ‘Sway’) to million selling Britpop superstars (‘Marchin’ Already’ bumped Oasis’ ‘What the Story’ from the top spot in 1997) to long-term touring allies with Paul Weller, they have always stood shoulder to shoulder with the greats of modern British rock. 2016 was a triumphant year for the band that included sold out shows at The SSE Hydro in Glasgow, 2 nights at the Millennium Square in Leeds to 12,000 people, a night at Times Square in Newcastle, 2 nights at Moseley Park in Birmingham and a night at the Manchester Apollo. Unforgettable nights for everyone who was there.